Melvin Edwards included in the exhibition Smokehouse, 1968–1970 organized by Eric Booker at the Studio Museum in Harlem, NY. 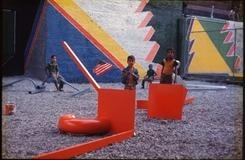 Smokehouse, 1968–1970 presents archival images of the work of the Smokehouse Associates, artists who developed community-oriented public art projects in Harlem aimed at transforming space through vibrant, geometric abstract murals, and sculptures. Photographs by Robert Colton, a Smokehouse Associate, depict the collective’s original members, William T. Williams, Melvin Edwards, Guy Ciarcia, and Billy Rose at work in Harlem, often alongside local teenagers and elders.